Two expositions are open at poet Jovaras' House: on the ground floor – "A Bookshop of the First Part of the 20th Century", on the first floor – "The Living Environment of Poet Jovaras (the Interiors of the 6th-7th Decades of the 20th Century". 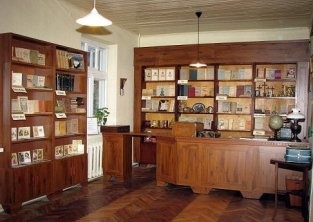 In the exposition "A Bookshop of the First Part of the 20th Century" a stylized Lithuanian bookshop's space of the inter-war period is created while interpreting the images of Šiauliai bookshops of that period. 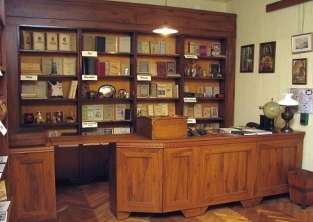 The view and the atmosphere of the inter-war period bookshop is recreated at the exposition: a kerosene lamp, soap, attributes of religion, statuettes, small frames, excellent ink sets as well as other things can be seen besides books, newspapers, and magazines. Do not be surprised – this is the way the inter-war bookshops looked like. You were able to get the most necessary household goods (see Fig. 1, 2). Every exhibited here book, newspaper or journal from the early 20th century you can browse or read while sitting by the table produced in Šiauliai during the inter-war period (see Fig. 3). 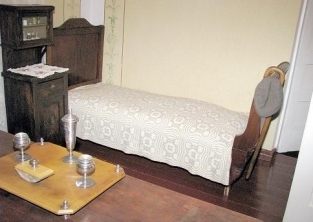 On the second floor of the house, where Jonas Krikščiūnas-Jovaras (1880–1967) – one of the most popular Lithuanian poets of the beginning of the 20th century, had been living since 1946, visitors will see his working room and the sitting-room. 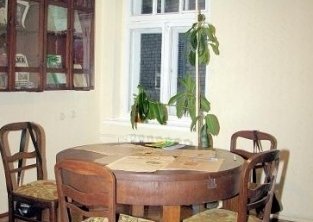 The rooms were kept not only as belonging to a particular person, but as well as the typical examples of the city dweller's lodging interior of the 6th–7th decades of the 20th century. 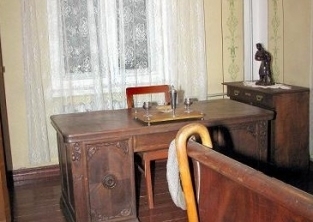 The rooms still have the polychrome wall decor, and almost all the furniture is a property of the poet, the gift of his son Giedrius Krikščiūnas for the museum. Conservation of the major part of the furniture was accomplished by Aušros Museum's Restoration Centre. 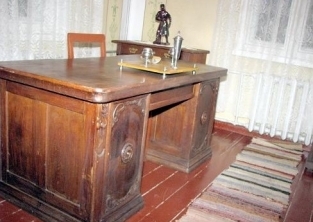 In the working room, besides the inherent attributes of the poet there is a massive writing table and a fully loaded bookcase, you can find a medicine chest that evokes the temporality of existence, as well as a walking stick with a cap hanging on the bed's end. According to the people who knew the poet, Jovaras could not enjoy very good health (see Fig. 4–6). 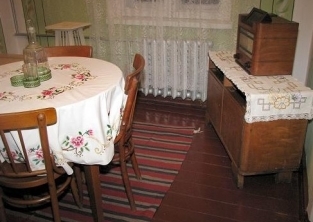 In the sitting room, a characteristic table for potted flower and a radio-set are put close to the window. The realistic impression is strengthened by the carafe with a tray, the guitar on a sofa, textile handicrafts. A portable kerosene stove marks the place of the former tiled stove, which gave out its warmth to the poet's home in Kalniškiai (see Fig. 7). The reconstruction of the living space relocates to the corridor, where authentic Kalniškiai homestead utensils provide an opportunity to experience the fragment of life of the turn of two centuries. An education class as well as the digital press stands can be found in the other rooms. Richly illustrated they present two poet's stages of life – before and after 1940. They are symbolically united by the sculptor's A. Toleikis "Poetry Muse". The creation of these exhibitions marks new Jovaras' House stages of being and activities as the subdivision of Šiauliai Aušros Museum. The concept of Jovaras' House was created by the work group, led by Irena Nekrašienė, Vita Andrulienė, Gražina Narbutaitė, Birutė Lukošiūtė, Biruta Girdenienė, Zita Šulcienė (designer).